Storage Dehumidifier to stop mould and mildew. Storage Dehumidifier with a difference. As we go through life, we accumulate clothing, shoes, bedding, curtains, rugs and other assorted contents. Our ability to collect things is not matched by an equal rate of disposal. We keep many things, thinking that we will use them again or may need it in the future. Our instinct to hoard often is related to sentimentality as well. Garages and basements all over Sydney, Melbourne, the Gold Coast and Brisbane will attest to our need to store. The explosion of commercial self-storage companies confirms that we have a storage problem. Having found the space to store our possessions, many of us simply forget that we own these items. This is where the second part of the problem starts. Given the right environment (time, lack of ventilation and light with a little bit of moisture) and the possessions may incubate mould. When we eventually remember we had that special dress or expensive leather shoes, it may be beyond cleaning or washing. We need a Storage Dehumidifier because we hoard and forget. 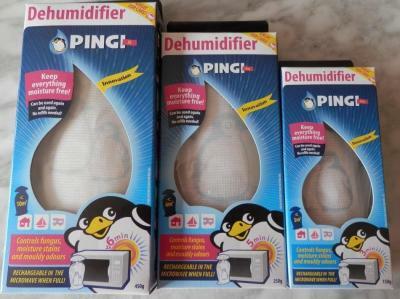 The PINGI Storage Dehumidifier requires no electricity or refilling. The products can be recharged in the sun or a microwave oven and will last a long time. PINGI MINI 150g is most effective in areas smaller than 3 cubic metres. PINGI MINI has a water absorption capacity of 60ml per cycle. PINGI BAG 250g is most effective in areas smaller than 6 cubic metres. PINGI BAG has a water absorption capacity of 100ml per cycle. PINGI XL 450g is most effective in areas smaller than 10 cubic metres. PINGI XL has a water absorption capacity of 180ml per cycle. Our products contain Silica Gel. More data on this ingredient can be found on Wikipedia. Very good information about problems with mould can be obtained from http://blackmold.awardspace.com/.